My new job has kept me very busy the past two weeks, and I haven’t had too much opportunity to get out on the trails (however, I did go surfing and climbing, so that should count for something…) With iffy weather on my day off, I wanted to do something big–I decided on Mailbox Peak. Unfortunately, the Middle Fork of the Snoqualmie Road is shut down for paving on weekdays…whoops. So I scrambled, and ended up shooting over to Rattlesnake Ridge. Rattlesnake is considered the tallest of the Issaquah Alps, and–to my mind–the most beautiful. It juts out right across from Mt. 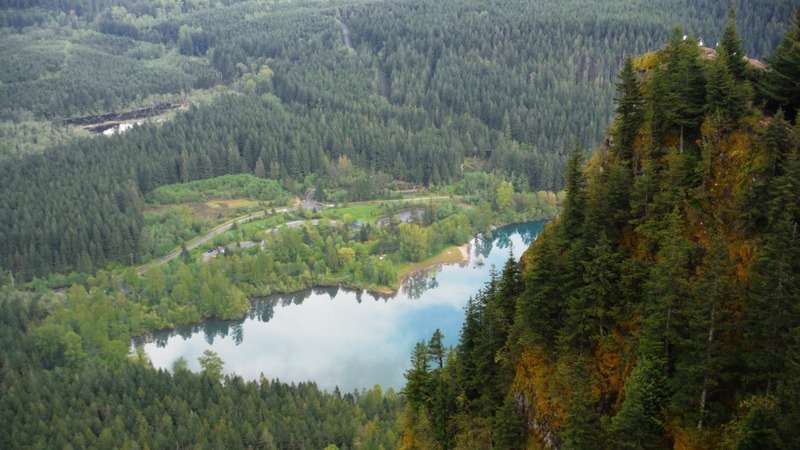 Washington, and is perfectly positioned to spy up the Middle Fork of the Snoqualmie Valley. 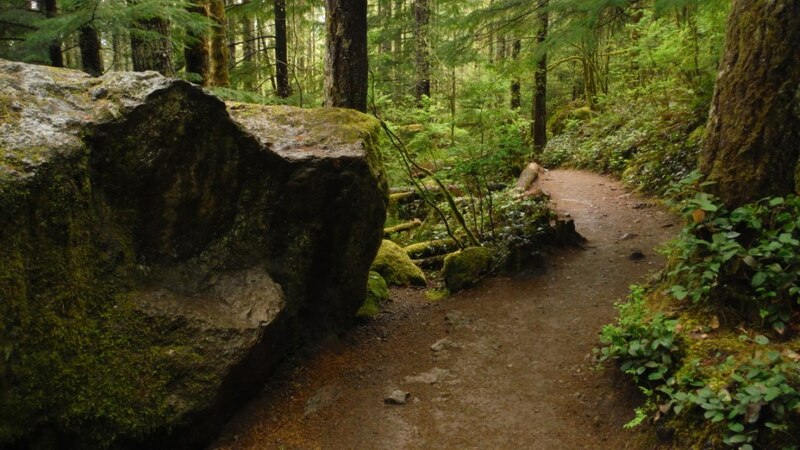 Rattlesnake Lake marks the beginning of the Rattlesnake Ledge trail, a heavy-use lake and trail system that does seem like it sees all of Seattle’s restless feet and paddles. But it is a sublimely beautiful area, despite the crowds. Motor craft are not allowed on the lake, so once the diesel gutter growl of an F-X50 truck finally subsides and the kayak/floatchair/who knows what is in the water, the lake is peaceful. 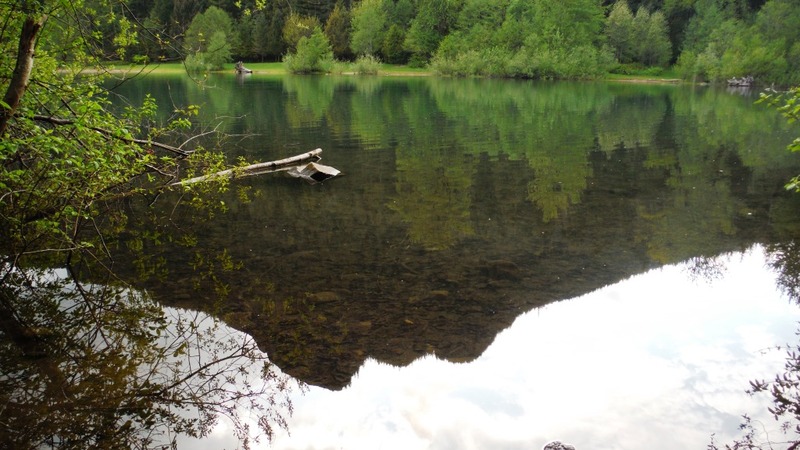 The trail starts halfway around the lake, quite obviously, with large interpretive signs warning folks of the angers of playing around on the ledges–noting that at least 2 people have fallen to their deaths off the Rattlesnake. The humid air kept me cool for the first few steps of the climb, but then the continued grade got me sweating. The Ledge is a climb of about 1,175 feet in 2 miles, so it’s no typical WA trail, but it definitely let’s you know you’re rising. There are hundreds of people on the trail. Seriously. It’s basically a short Mount Si. I actually passed a young man using his speaker phone to make calls while hiking–to each his own? It seemed like an entire high school was there at one point, and I’m pretty sure I saw a cat on a leash. So, that’s the trail up to the ledge–good Cascade mud/pine mix while cruising past folks in sneakers and heels…interesting juxtaposition. understand the madness of the full-fledged party on the rocks–and continue up. Just a little bit further are much better, much more secluded (relatively) ledges from which to observe the main ledge, clouded Mt. Washington, Mount Si, Snoqualmie Valley, a teal Rattlesnake Lake, and in the distance–Seattle’s water supply deep and cold in Chester Morse Lake. I sampled each consecutive ledge, and while the top ledge is the most private, the middle platform probably has the best view…Each is a wonderful place for enjoying deliciously smooth pipe tobacco (recently smoking Planta’s MMVII–excellent stuff!) I’m almost thinking of setting a new category of amazing places in which to smoke a pipe. Good Pipes, Great Views–a photography review of the Cascades! Before I enjoyed that fine smoke, I had to reach the actual “summit” of Rattlesnake Mountain. Along the ridge, there isn’t really a great summit moment, just a long ridge that is often blocked out by trees. As well, whereas the ledges were dry and cozy beneath a low ceiling, the higher altitudes of Rattlesnake were bathed in cloud–leading to a constant light-to-heavy downpour as I slogged up the trail. Nothing is too spectacular in the upper reaches of the ridge–roads crisscross the mountain from utility upkeep, old logging, fire, and even old quarrying! There are some pretty green sections, and the salal grows carpetesque. Finally, I reached the East Peak, marked by a radio tower. It had stopped raining, but the view was obscured by billowing cloud, so I quickly retreated down the path to enjoy the relative dryness of the ledges. 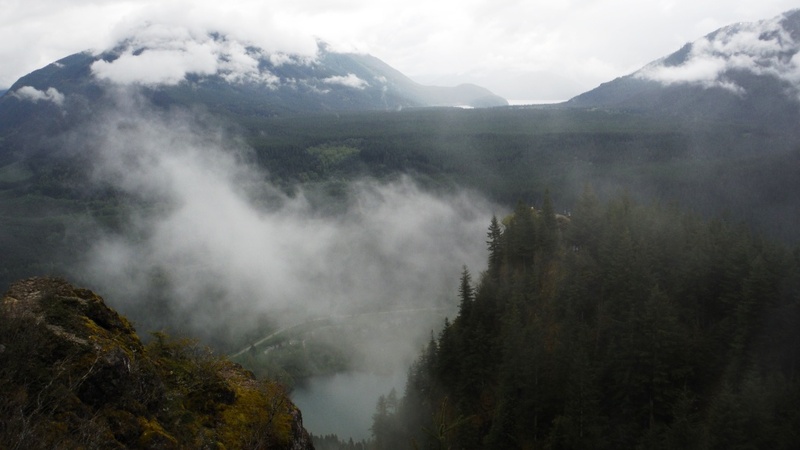 As I smoked, the clouds roiled and tumbled in the Middle Fork valley, finally falling exhausted into the larger Snoqualmie plain, setting off small rainbows below. On the green-blue still surface of Rattlesnake Lake, a lone kayaker slid by soundlessly, cutting the plate glass water. Echoes of conversation bounced and drifted off the rocks from the main ledge, but I smoked in silence. All in all, a pretty good hike. You should get a nice camera! You won’t regret it :). Oh and thank you about my pictures! 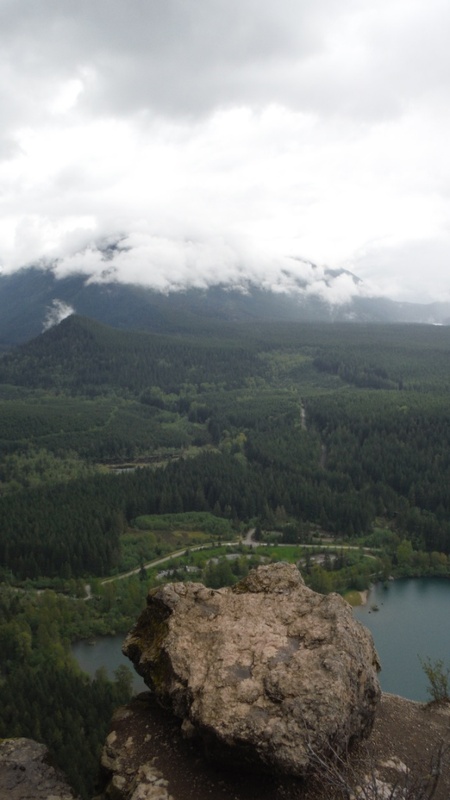 Rattlesnake Ledge is definitely a great trail. I went there for a sunrise hike once during February. It was snowing at the top when I went. I hope to go back again soon during a nice clear, sunny day. Thanks, Sophia! It is a nice hike, and sunrise must be wonderful from the ledge! What time did you have to leave to get to the ledge for sunrise?